H.P. sauce was on the menu last night. 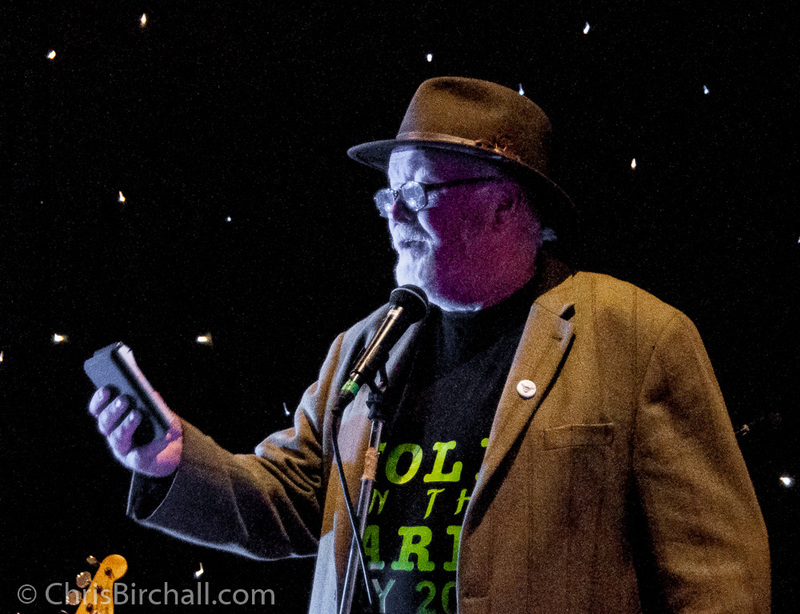 Sauce, banter, gags, giggles …oh yes, and some belting music too! 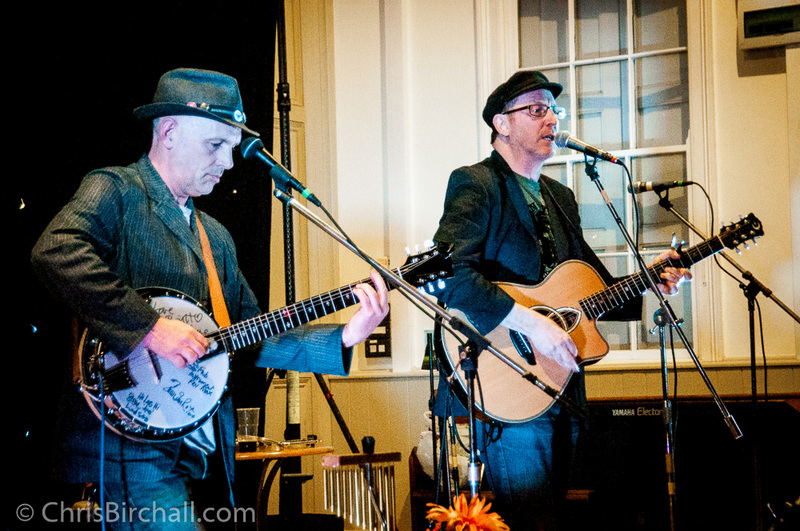 All this was served up by Henry Priestman and Les Glover at the very first gig to be held at the newly refurbished Black Park Chapel in Halton near Chirk, a community driven project with the aim of protecting our heritage and encouraging expression, confidence and creativity through music. 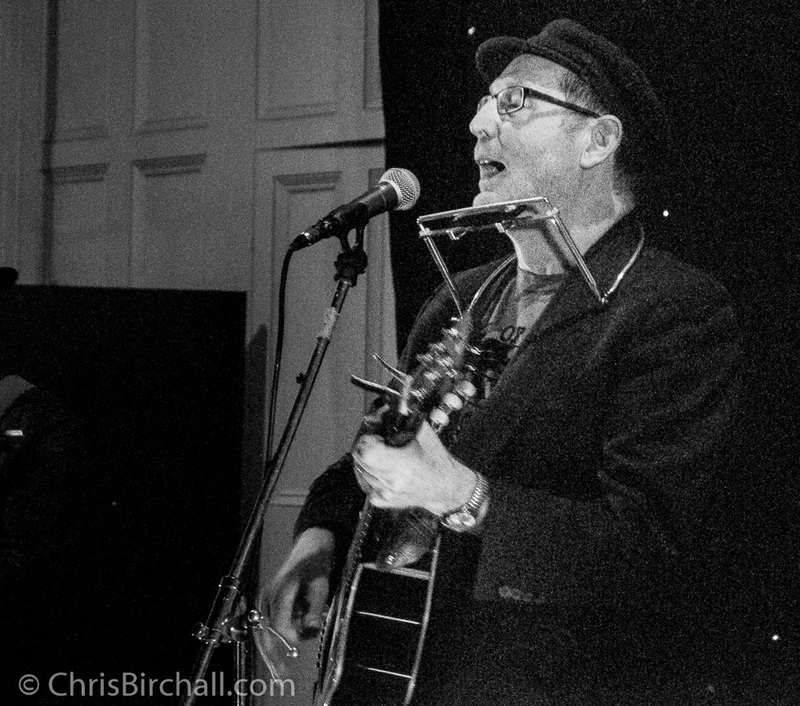 Since leaving Merseyside band, The Christians, Henry has forged himself a solo career playing venues all over the country, from Festivals to Folk Clubs, grand Theatres to humble House Gigs. Tonight he was performing with trusty sidekick Les Glover. They make a great double act, music’s answer to Morecambe and Wise. And yes they did “bring me sunshine” on a dank cold evening. Highly entertaining, with lots of laughs between the songs as they ribbed, teased and bounced off one another. But if H.P. and Loved-up Les were the main course, we were served up a tasty starter in the form of Elfin Bow. 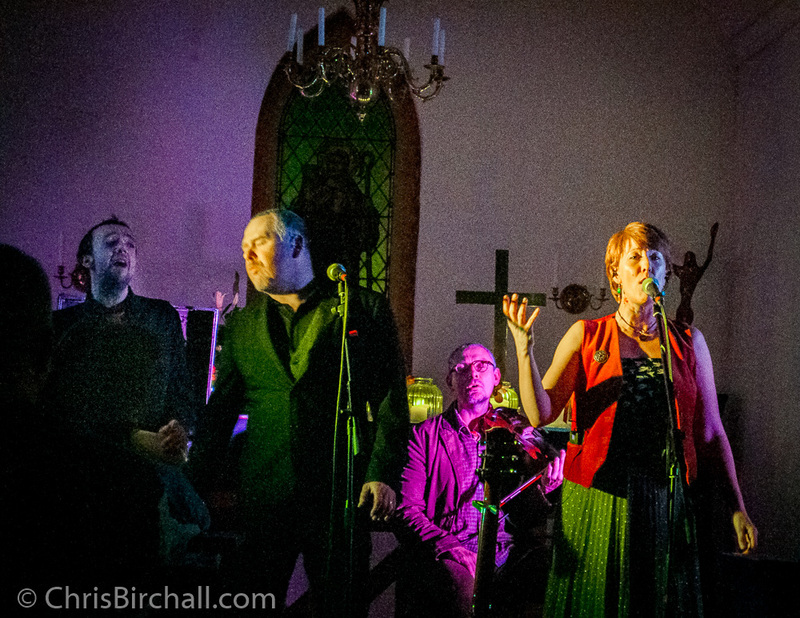 Having been a backing singer in many bands, including that of her husband Gary Edward Jones, the deliciously diminutive Elizabeth Ann Jones has recently struck out on her own, forming Elfin Bow, comprising Oscar South on bass and electronic wizardry, and with Maz on backing vocals. Their performance was so polished it was hard to believe this was only their third or fourth live gig. Their set opened with a beautiful, haunting, almost choral-like number, sung a-cappella, save for some very subtle synthesized backing produced by Oscar’s box of tricks. 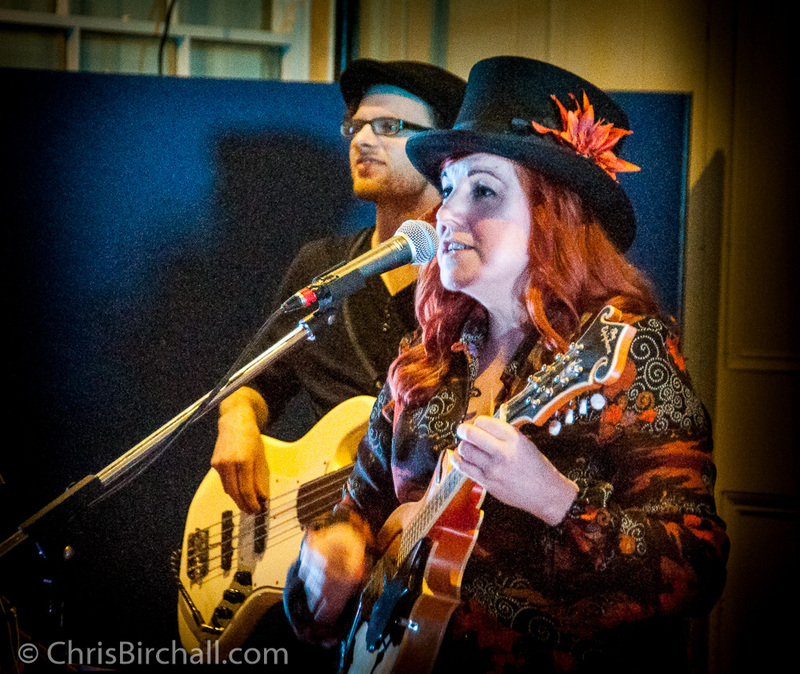 And as the set continued, it was easy to see that this flame haired songstress is set to establish a firm foothold on the music scene with a unique and refreshing style all of her own. I can’t wait for the release of Elfin Bow’s first album, which is currently in the making. 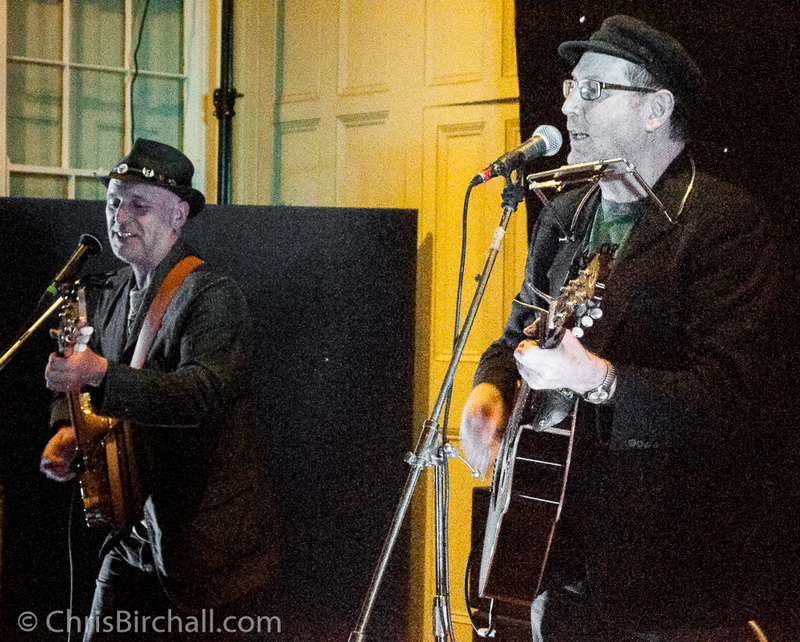 The whole evening was a musical treat that did far more than just whet the appetite for the subsequent monthly concerts that have been planned by godfather of the local music scene, Mark Holdsworth (right) as an adjunct to his popular Narrowboat Sessions. 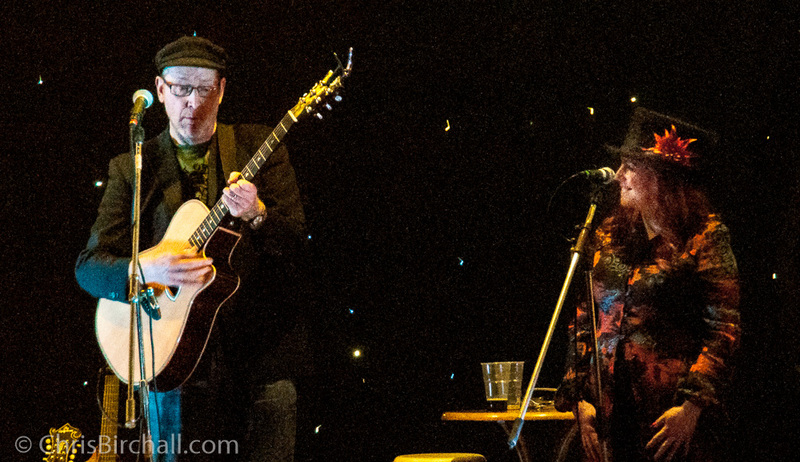 One of my favourite moments was when Elizabeth joined Henry on stage the lovely ballad Valentine Song that Henry co-wrote with Lotte Mullan. 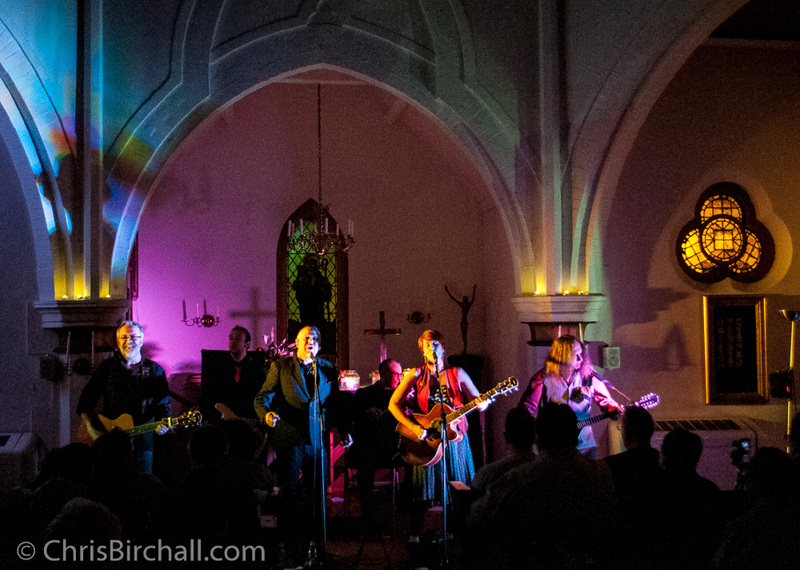 Let’s hope the Black Park Chapel will become a sought after and well supported music venue, and fulfil its aim to raise money for good causes. The next concert features Gary Edward Jones on May 21st. “Hello, This is Grateful Fred …No not dead, FRED …Yes, we’d like to play Merry Hell in your church”. 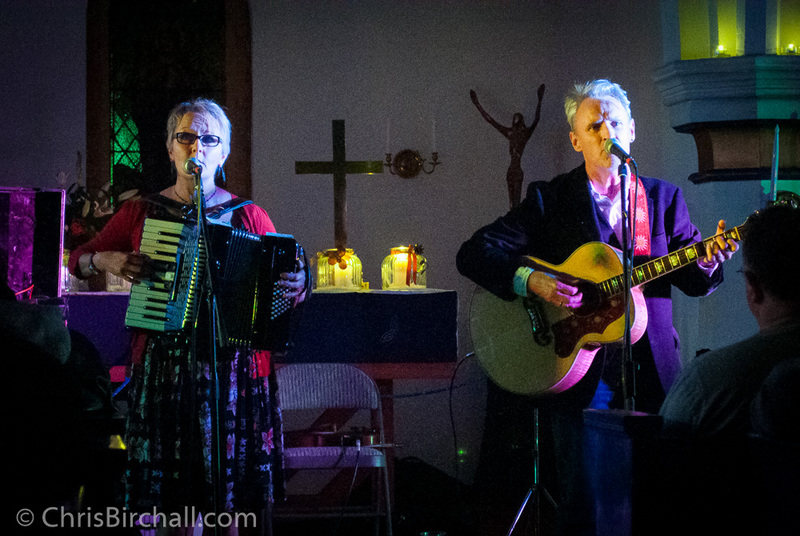 Well Colin Maddocks (aka Grateful Fred) and Merry Hell’s Virginia Kettle obviously managed to convince the powers that be, that their intentions were good and that the request had nothing to do with Zombies or Satanism, because the Concert For The Refugees went ahead this week at The Nordic Church in Liverpool, raising over £1,300 for “Médecins Sans Frontières (MSF)” who undertake amazing work throughout the world helping refugees. 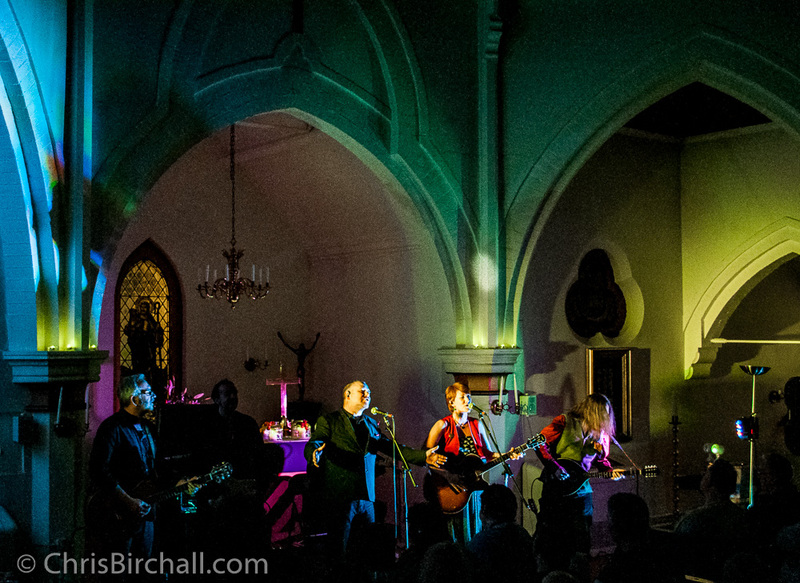 It was a great night of music at this magnificent venue, with Wigan-based folk rock band “Merry Hell” in the headline spot, supported by ‘The Grateful Fred Ukulele Trio” and “The Good Intentions”. And that’s how the evening started – with Good Intentions. Or at least two-thirds of them. 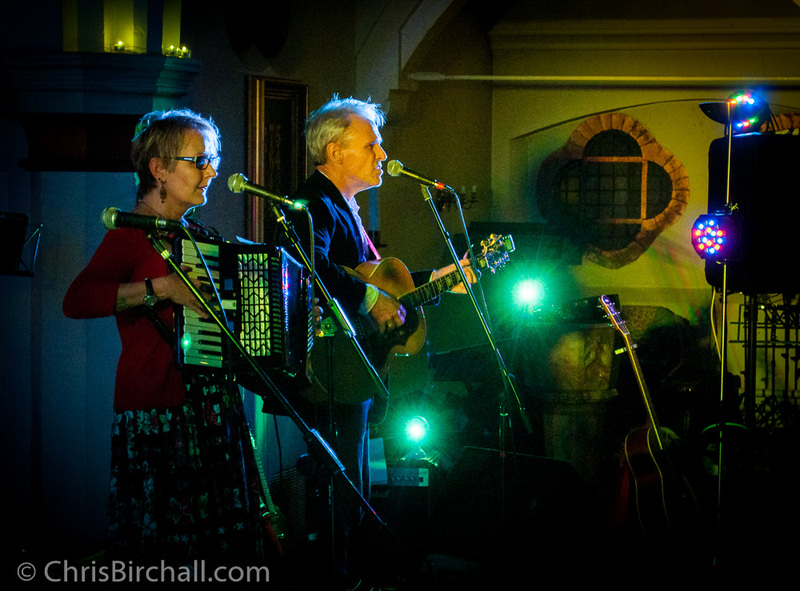 Peter Davies on guitar and Gabrielle Monk on accordion, opened with a lovely set of Americana Country songs from the band’s extensive repertoire. Then it was over to the Grateful Fred Ukulele Trio. I’d heard good things about these guys but …Wow! this was not the sort of sound I was expecting from three blokes strumming ukuleles! 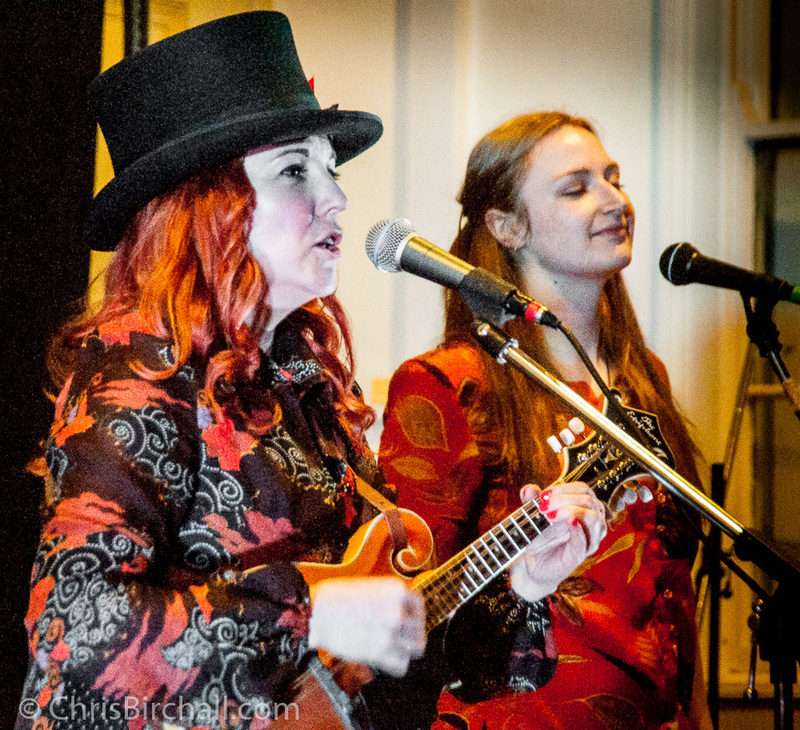 This was largely because there was little or no traditional uke strumming going on during their fantastically entertaining set. And definitely no leaning on lamp-posts! These guys have transformed my perception of that humble little instrument forever! 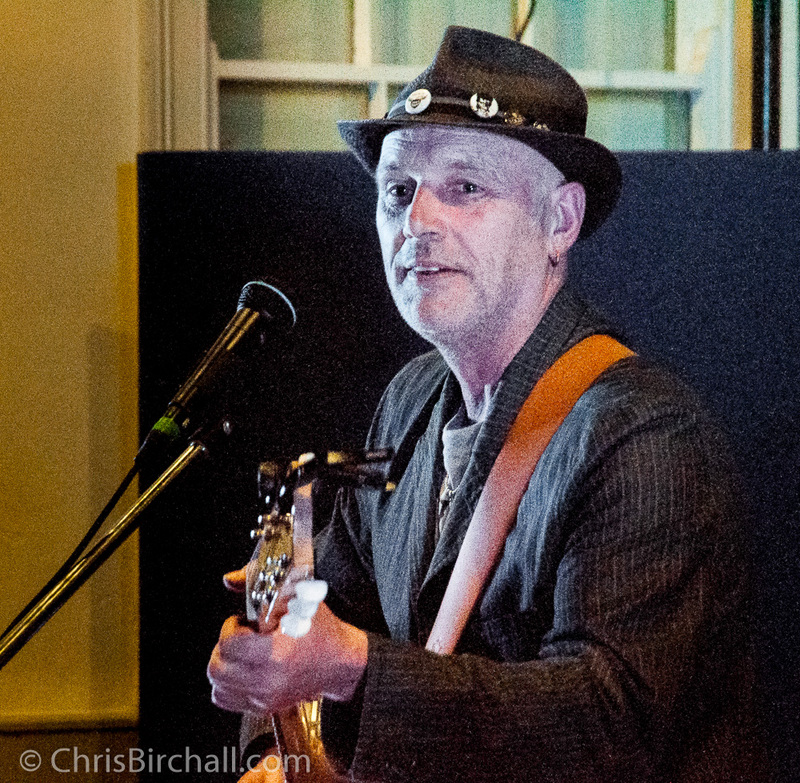 Colin has put together a band in the classic lead, rhythm and bass formation – but using ukuleles instead of guitars! Yes, that’s right, I did say bass! Halfway through their first song I found myself wondering why they had a bass player hidden away somewhere out of sight. But no. 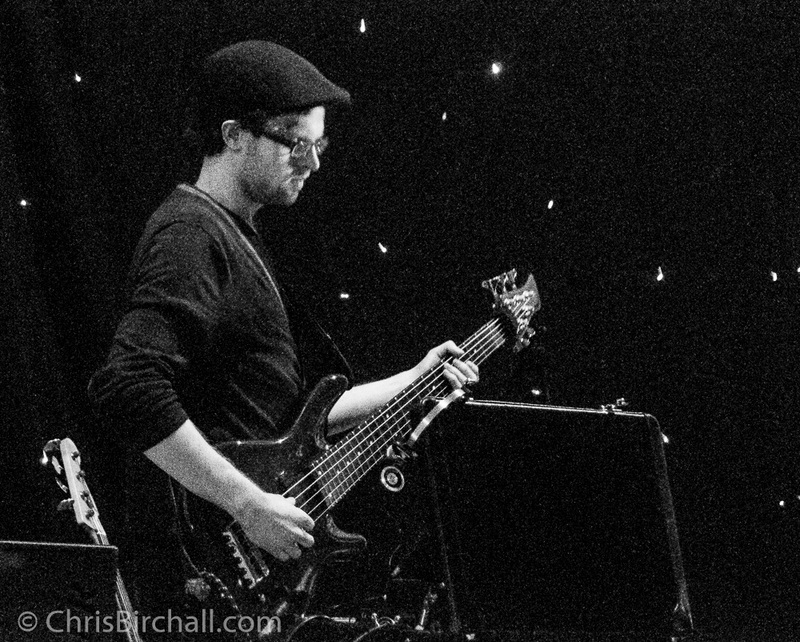 It was Colin, stage centre, with a tiny (in bass instrument terms) bass ukulele, who’s 21 inch scale was producing a sound as deep and rich as you’d expect from a full scale bass guitar. His right-hand man Vince Gillespie made a tiny uke sing like an electric guitar, with lead riffs at times reminiscent of those heard on Elvis’s Jailhouse Rock album. 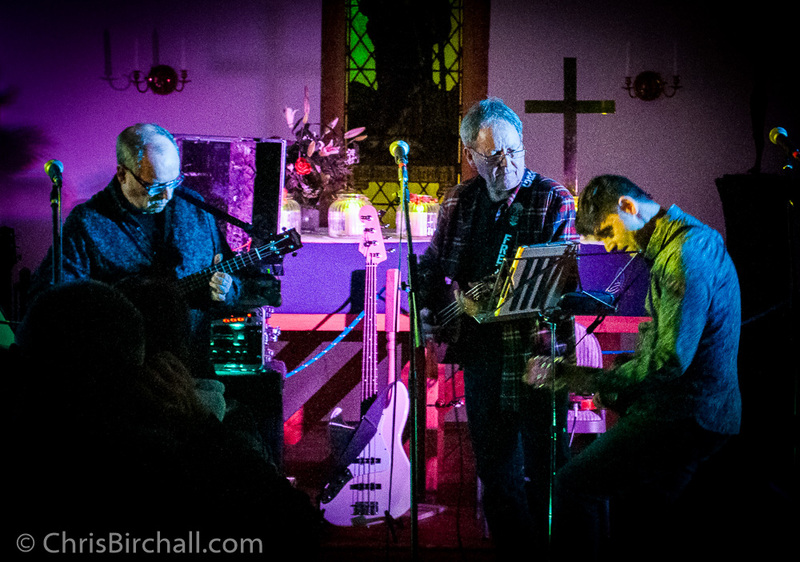 The Rhythm section came in the animated form of Pete McPartland performing on a six stringed uke and sharing lead vocals with Colin. Their set was varied, lively and highly entertaining, with Pete and Colin ripping through the instrumental solos with the rock ‘n roll style face-offs normally reserved for Quo rockers Parfitt and Rossi. Magic stuff! 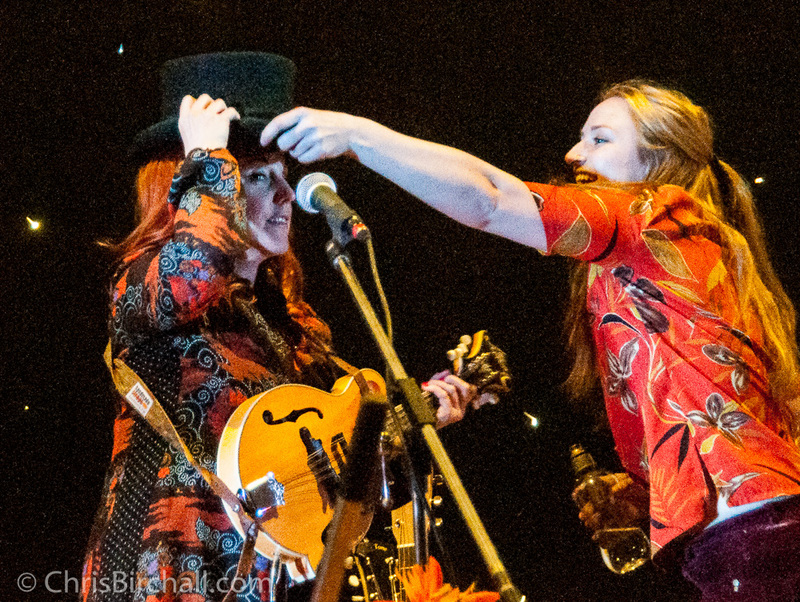 And the rock ‘n roll continued …with the gusto and fervor that comes with every Merry Hell performance. The infectious enthusiasm, the rousing melodies and the catchy meaningful lyrics had the whole audience tapping, clapping, singing along and (quite literally) dancing in the aisles. You never see a glum face at a Merry Hell gig. The old favourites were there, including the likes of Drunken Serenade, Crooked Man, Baker’s Daughter and Bury Me Naked, and some new favourites too like the title track off the “Ghost in our House” album. There were moments of poignancy, and a sense of outrage even, on their the anti-war song Old Soldier. Then, at the end of the evening, just before their usual rip-roaring finale, they silenced every tapping foot and touched every heart in the room with the most beautiful a cappella rendition of a brand new Bob Kettle song, Refugee. All six band members took a verse each. How they did it without choking up on the touchingly beautiful sad lyrics is testament to their professionalism. All in all, a fabulous evening thoroughly enjoyed by the capacity audience who all gave generously to the worthy charitable cause. And it was all down to the organising skills of Virginia Kettle and Colin Maddock. We are ALL grateful Fred! Three days ago the world of metal was hit with the news that Lemmy had died suddenly, shortly after celebrating his 70th birthday. He had grown up here in North Wales where he reputedly acquired the nickname Lemmy because he was forever borrowing money off his friends “lemmy a fiver”. When he ventured into the wider world, he joined a band called Hawkwind then one called Motorhead and the rest, as they say, is history. Rock history. He became the stuff of legend. Now, I have three musical sons and as a family we seem to embrace everything from punk to modern folk. It is Isaac who most embraces the metal genre, whilst at the same time leaning toward folk rock. So it was no surprise when yesterday he turned up with his band, The Beekeepers, and asked would I help film a quick video for their laid-back acoustic cover of Ace of Spades. We quickly cobbled together a concept for the shoot, that would be done against a projected background of a grainy black & white Motorhead video. A ropey projector was borrowed from (I can only assume) a member of the dead pixel society 🙂 , and we were good to go. The shoot itself took just shy of an hour and then Isaac spent most of the night on the edit. The result was just what we had hoped for – a shadowy, raw, gritty and gutsy cameo that I hope is a fitting tribute to the late great Lemmy. If you like this version by Isaac and the Beekeepers, click here to go to Bandcamp where you can buy it for a £1 donation, every penny of which will go to Cancer Research U.K.
There’s a great read in The Telegraph this week. The 58 best Folk Albums of 2015, reviewed by the paper’s culture editor Martin Chilton. There are some of the names you’d expect, such as Richard Thompson and Fairport Convention plus some newcomers too. I was particularly pleased to see Wirral lad Joe Topping up there with his new album The Vagrant Kings, and the Wigan based folk rock group Merry Hell (whose drummer Andy Jones lives in my home town of Ruthin) with their third album A Ghost in our House and Other Stories. It’s a great read and a good way to find additions to your folk music collection. I write this as someone who contributed in my own small way to The Mersey Sound back in the sixties. With my band, I trod many of the same boards as the “Fab Four”, including the original Cavern, The Iron Door and The Tower Ballroom, although sadly we were never on the same bill. So yes: “Been there. Done that. Worn the tee-shirt”. 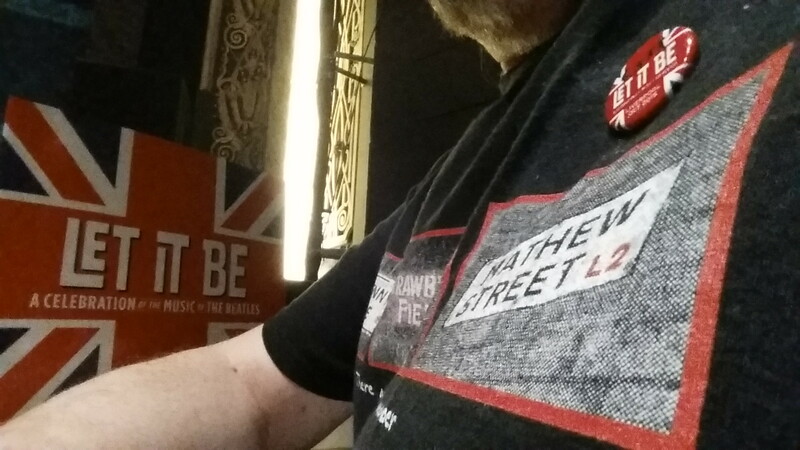 I still do actually, and in fact was sporting my latest one at The Royal Court for yesterday’s press night with my complimentary “Let It Be” badge proudly pinned in place. Yes… I’m a Beatles fan! As a musician myself, I’ve always thought how boring it must be to play in a tribute band. You see, a covers band that slots a few Beatles numbers into its repertoire, will be well received by the majority of fans even if they don’t sound like the original. 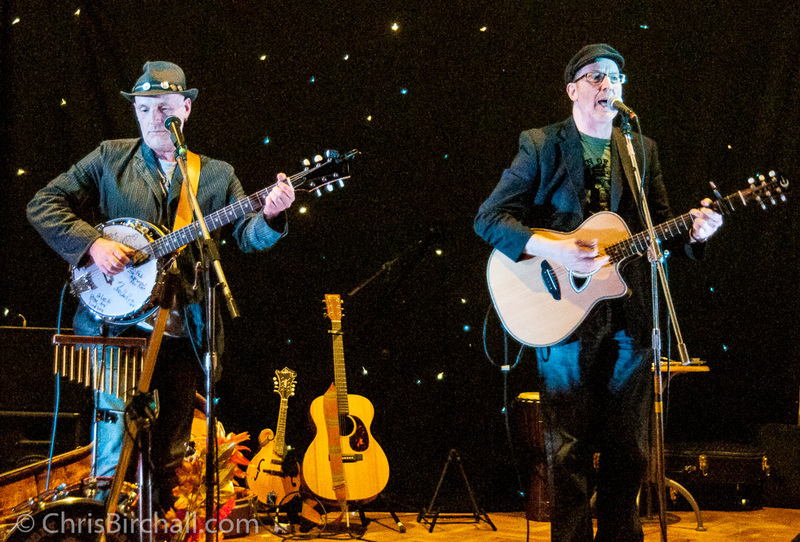 A covers band can put a new twist on an old song, do their own interpretation, inject their own pizzazz – and that approach is to be applauded. Tribute acts, on the other hand, particularly those who strive to look and act like the originals, are by definition charged with the task of authenticity. They need to sound absolutely like the original too. 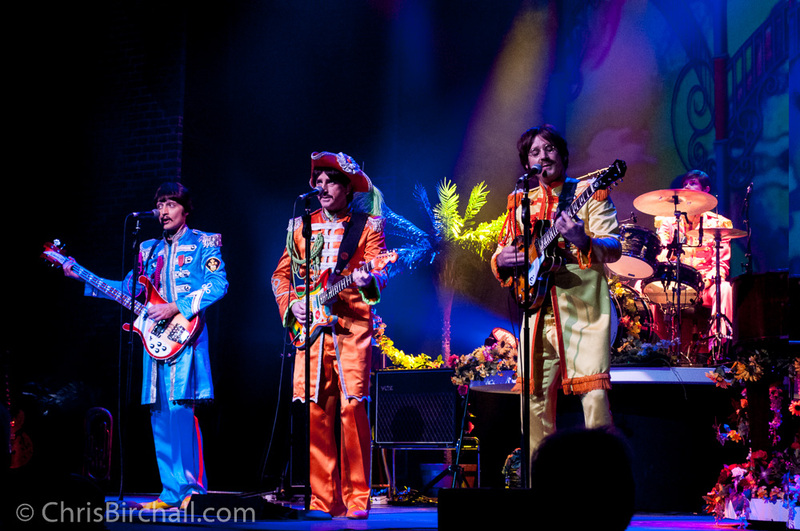 I’ve been to many shows featuring Beatles tribute bands over the years and because I’ve been a fan since those early days, and because their music dominates my record collection, you can imagine I always go along with a critical ear, whether it’s a Thursday night at The Cavern or a full blown theatre production. 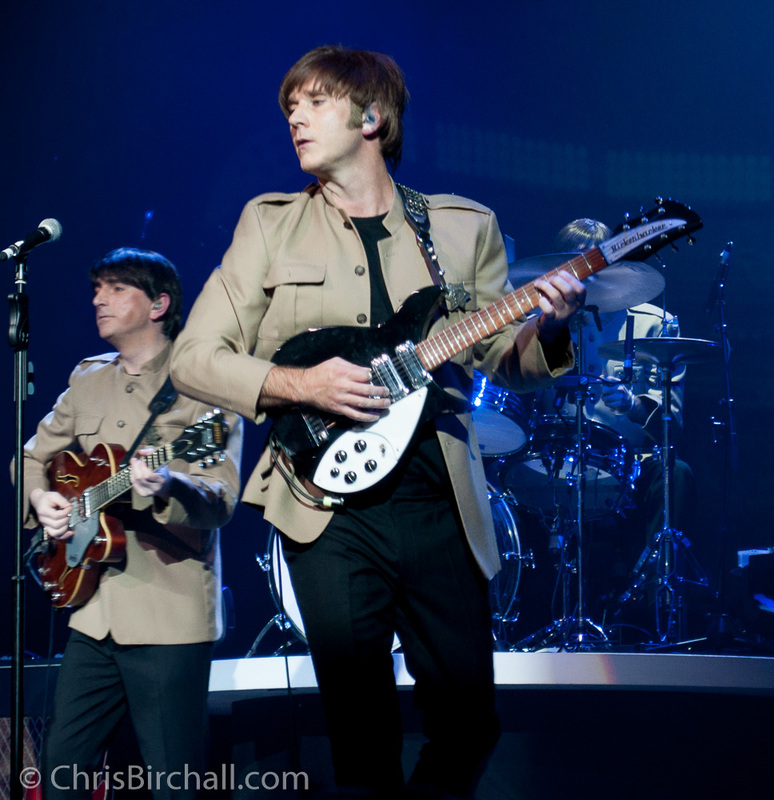 Liverpool has spawned the best of such bands, one of the most successful being The Bootleg Beatles, who have performed more than 4000 gigs over the last 35 years. Then there are the BackBeat Beatles, often billed as “As near as you’ll get to the real thing”. We saw these guys at The Philharmonic back in 2010. It was quite literally, a note-for-note performance of the Sgt Peppers album from start to finish and they did look and sound like the Beatles. Right down to the rolling crescendo in A Day in the Life. At that show I could have easily believed the past 50 years had been a dream and that I was back in 1967 watching the real thing. Sadly this authenticity was lacking in last night’s performance. Don’t get me wrong the music last night was good and it was a lively show that had a fair number of the audience tapping, clapping and singing along to the forty familiar favourites. But it was good in a “covers band” sort of way. There were some pretty obvious sound engineering issues which hopefully will get ironed out during the rest of the run. And the musical direction also left something to be desired. The aforementioned rolling crescendo during A Day in the Life for instance, was pretty pathetic. 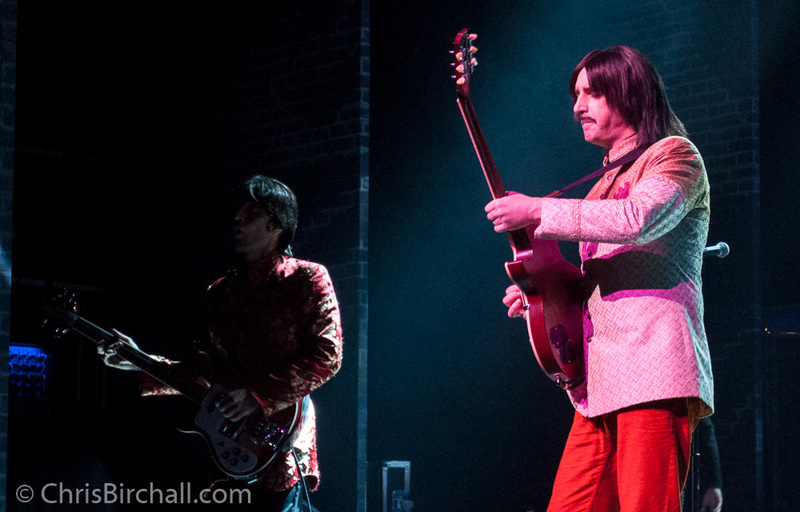 Generally the overall sound was too bassy and despite the presence of the Vox amplifiers on the stage and (for the most time) the correct guitar marques being used for the right songs, it somehow fell short of that authentic Beatles sound. Neither were the lighting and effects up to the standard we have become used to at The Royal Court. 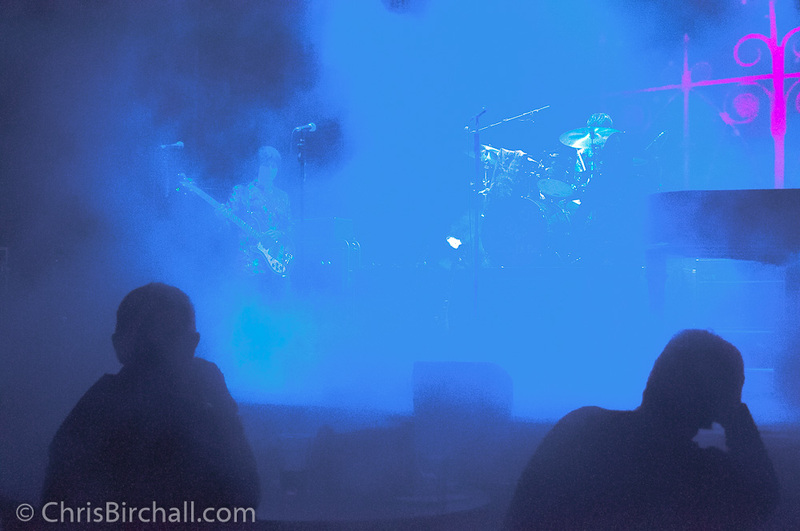 When Lucy was In The Sky With Diamonds, the entire band completely disappeared at the hand of an over zealous smoke machine operator – and so did the first couple of rows of the audience! All this is such a shame, because when the Royal Court put on a home-grown show (this one’s a “West End” touring show) they tend to get it right. Hopefully these are teething troubles or press night gremlins that won’t blight the rest of the run. 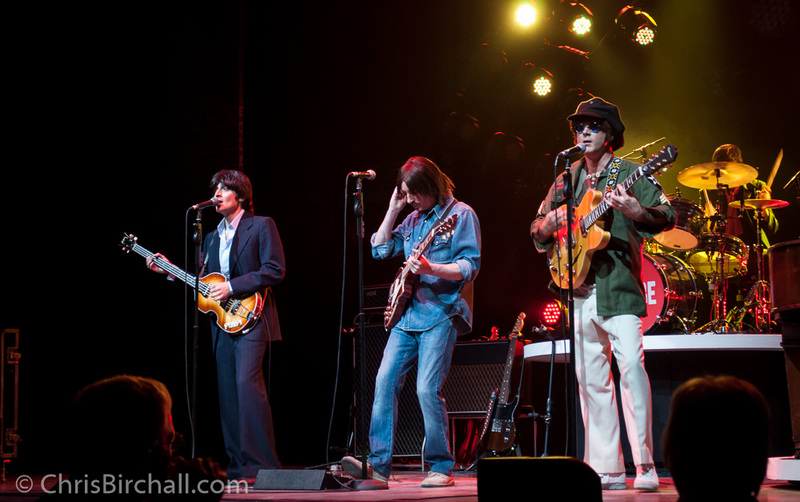 During the first half of the show, the band managed to get at least some of the audience on their feet for a few of the songs. The second half was decidedly better, with some belting vocal performances and accomplished nifty guitar work. When Come Together ran into Get Back ran into Revolution the musicianship was second to none and the audience when wild for it. 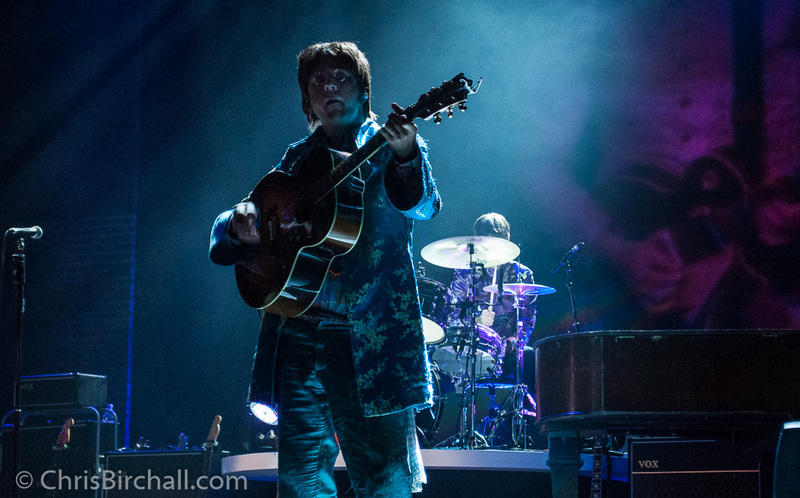 And when Paul Mannion (who played George) performed the solo in While My Guitar Gently Weeps it was every bit as good as the original played by Eric Clapton on The White Album. Mannion played it live and he played it brilliantly. If I had to pick a song that sounded most like the original it would be Penny Lane possibly followed by Hey Jude in the encore set, which had the entire auditorium singing, clapping and “rattling their jewellery”. The banter between songs was less convincing. 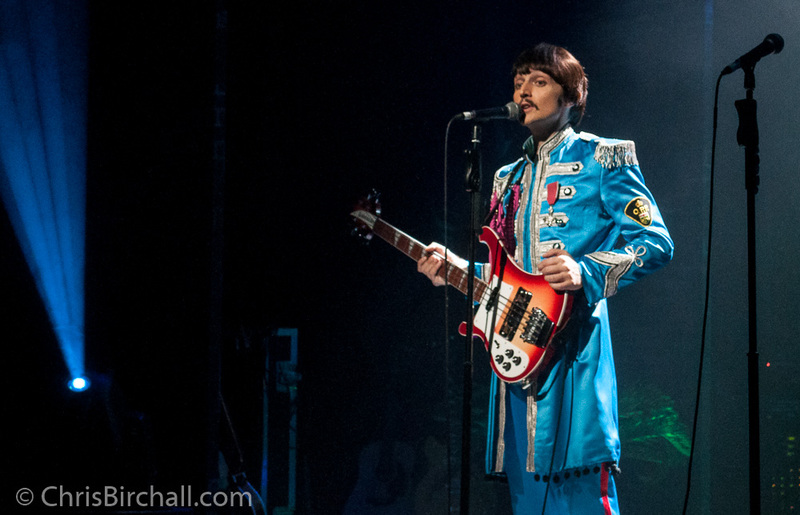 The only Liverpudlian on stage was Paul Mannion, who also played George Harrison at The Royal Court in Bob Eaton’s excellent 2010 production of Lennon. 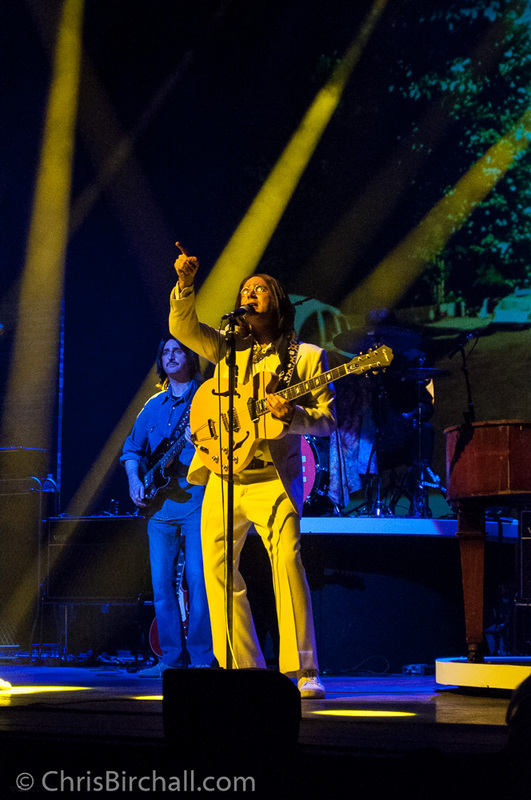 Although Emanuele Angeletti’s vocals as McCartney were pretty good, he appeared to give up on the accent in between songs. 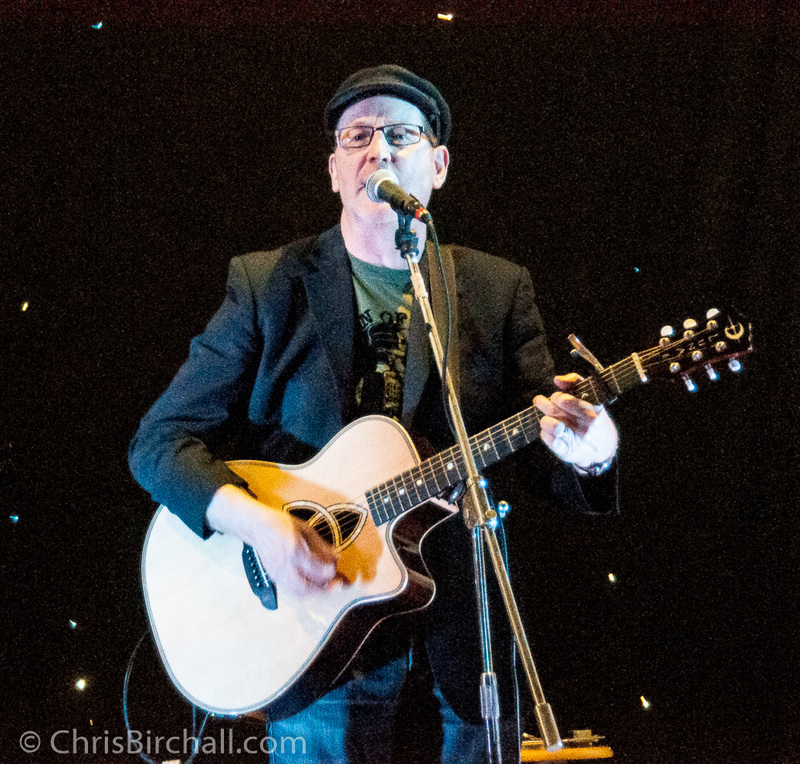 Paul Canning too delivered some convincing Lennon vocals but failed with both the mannerisms and cheeky banter department. And Luke Roberts managed to tone down his undoubted skills to recreate the steady unsophisticated beat that defines Ringo’s drumming. So would I recommend you go and see Let It Be? Hell yes! 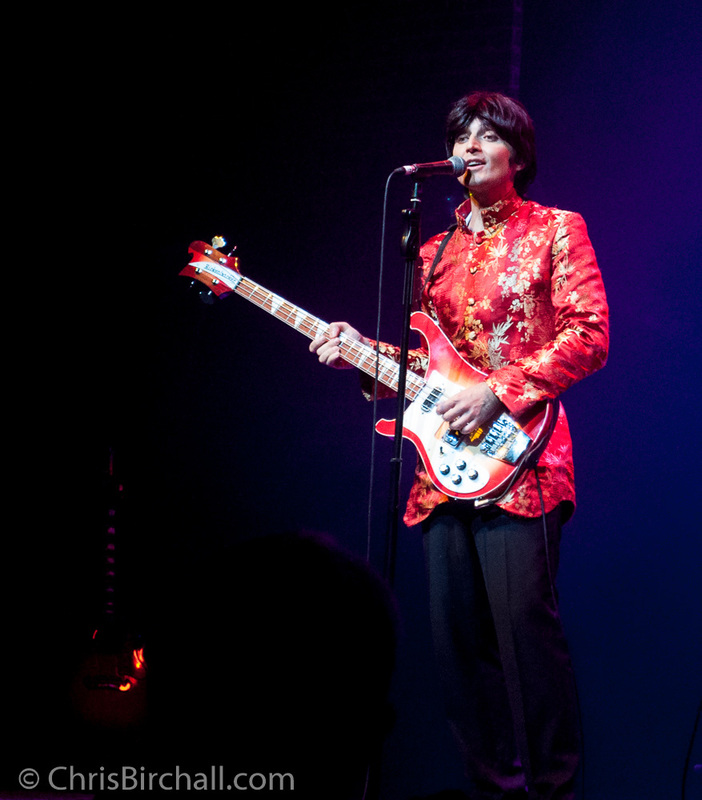 But with a proviso: Go along to enjoy an evening of Beatles covers and you won’t be disappointed. 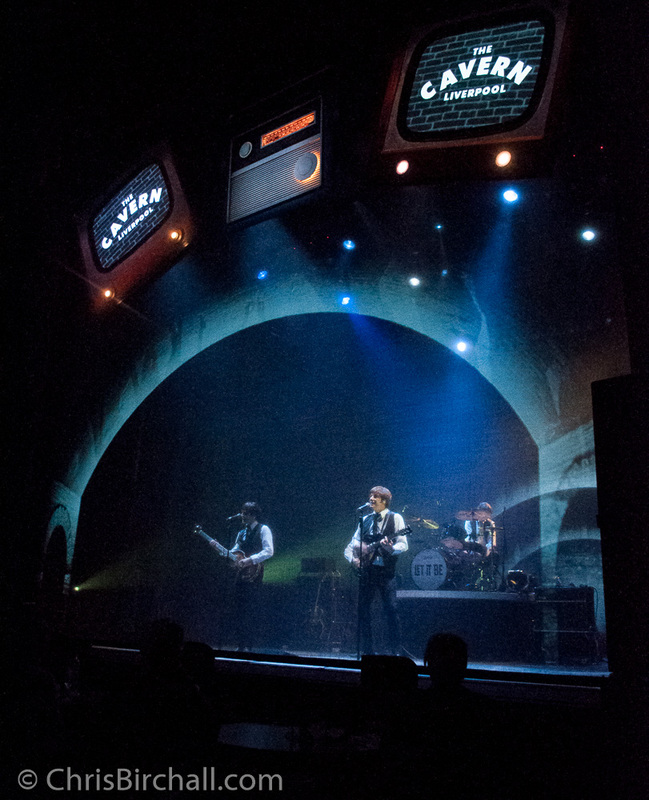 The show is an anthology billed as “A celebration of the music of the Beatles”. As such it succeeds. 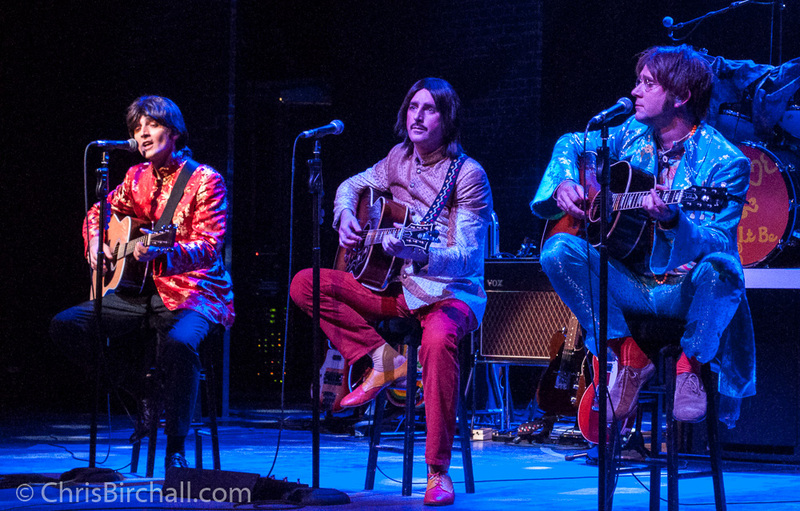 So long as you remember that although there are costume changes to define each Beatles era, it is not a “musical play” in the same way that Lennon was at this same lovely theatre last year.